It may not have been keeping you up at night, but if you have ever wondered how to use a blowgun, we can tell you. We got the opportunity to try it, because our Amazon tour took us to a Kichwa village. Also known as a dart gun, it’s the traditional method of hunting for many Amazon tribes. What does a blow gun look like? 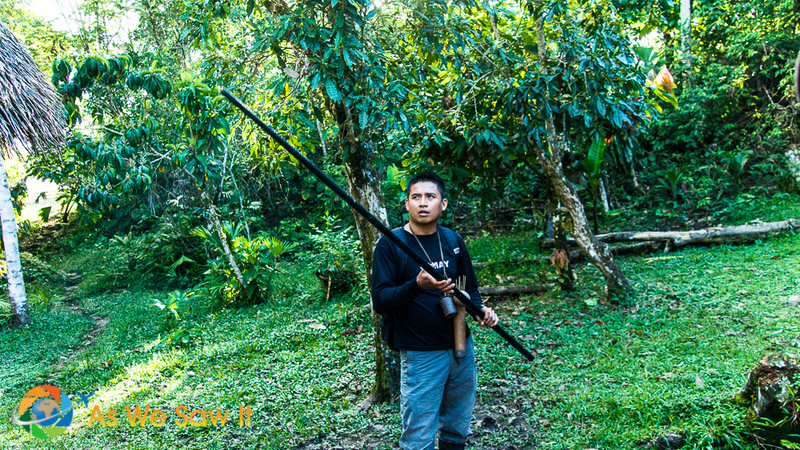 Our Kichwa guide brought out a straight, hollow stick that was “only” two meters long. Just right for tourists. He doubted we would have the hand strength to handle a larger one. Think of it: The largest blowgun is 4 meters long and a healthy hunter with good lung capacity can send a dart 50 meters! Okay, but what use is a blowgun without darts? Our first lesson was in how to make poison darts. This was getting interesting. Peel a long splinter off the hard part of a palm frond. Cut a narrow channel a few centimeters from the tip. Insert a little curare into the channel near the tip. The curare, not the dart, is what kills their target. Curare, which they make from plants, is a poison that paralyzes voluntary muscles. Once an animal is paralyzed it is easy to kill. Depending on their length, Kichwa make their dart guns from a number of things. Ours was made of palm branches that had been hollowed out, glued, then tied together. The thing is surprisingly lightweight, which I guess is important if you're going to be carrying it through the forest on a hunting expedition. Even at two meters it was easy to balance and aim; I didn't have to use much muscle to hold it steady. 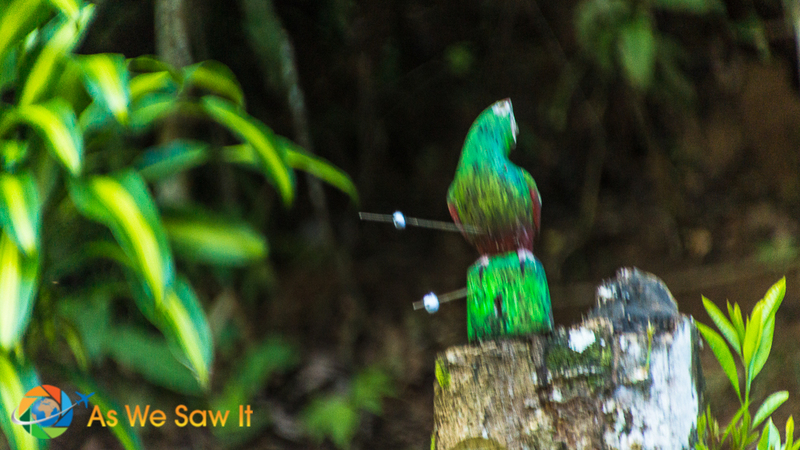 Our tour guide had set up a target: a great big, green, fake parrot atop a tree stump. The fact that their chickens were walking around the target area gave me a little concern, but it didn't seem to bother the Kichwa any. Had there been a casualty I would guess they would have eaten it for dinner. There's a precaution here: Never rest the gun on the ground. Don't forget that, my friends, or you may end up with a mouthful of dirt. So, how well did we do with the dart gun? As expected, my Eagle Scout husband outdid me. I hit the stump (see below) but he nailed the parrot full in the chest. Those darts travel so fast, I (sort of) caught it on video. Maybe I will put it online one of these days. Our tour was similar to this one and with the same company. AmaZOOnico: Animal Rescue in Ecuador’s Amazon. See our Cotococha photos here.